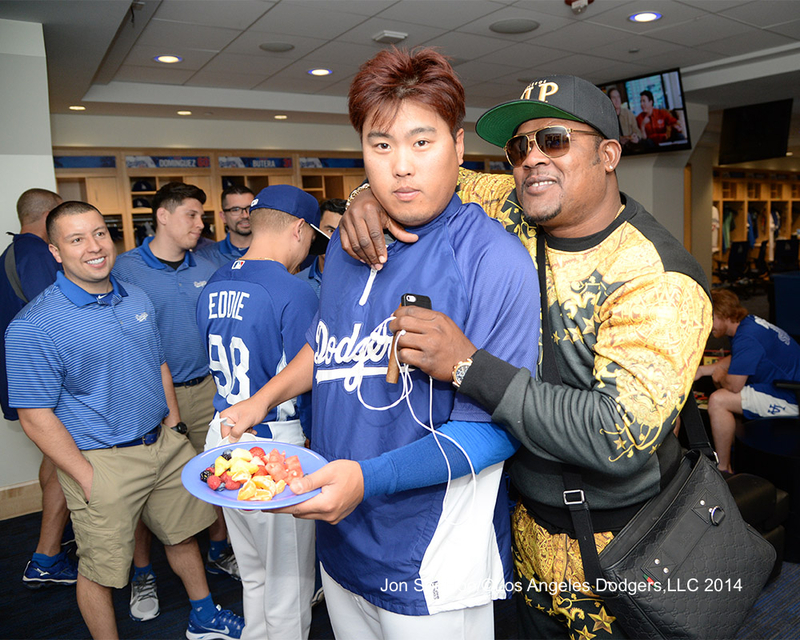 Dodger pals Hyun-Jin Ryu and Juan Uribe do so many other things together, they might as well come off the disabled list together. Ryu (out since August 13) and Uribe (out since August 15) are in the starting lineup for the Dodgers today, with Carlos Frias and Miguel Rojas taking the smallest of detours to the roster of Triple-A Albuquerque. Frias and Rojas can rejoin the Dodgers after the Isotopes’ play their final game of 2014 on Monday. Other reinforcements from the minors can come as soon as Monday, when rosters expand to up to 40 players. Before leaving his August 13 start with two outs in the sixth inning, Ryu had made five consecutive quality starts (averaging 6.5 innings with an ERA of 1.91), nine quality starts in his past 10 and 14 out of 16 since his previous DL stint ended May 21. He has a 3.28 ERA and 8.0 strikeouts per nine innings this season. Uribe is batting .293 this year, albeit with only 12 walks, and is the National League’s top-ranked defensive third baseman, according to Fangraphs. Though it was ultimately in vain, the Dodger defense put on a show Saturday. Take a look. Throughout their history, like any other team, the Dodgers have hit the wall offensively from time to time, far worse than their three runs in 22 innings this weekend in San Diego, including Saturday’s 2-1, 10-inning loss. Only two years ago, there were three consecutive shutouts by the Giants. And before that, these droughts from 2007 and 2003. And so on back through time. 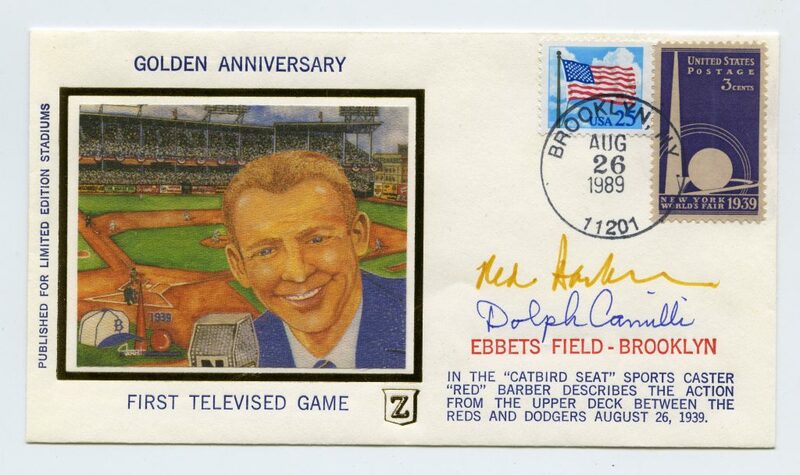 It’s almost impossible for anything to surpass the 33 consecutive scoreless innings that finished the 1966 World Series, a year before I was born. 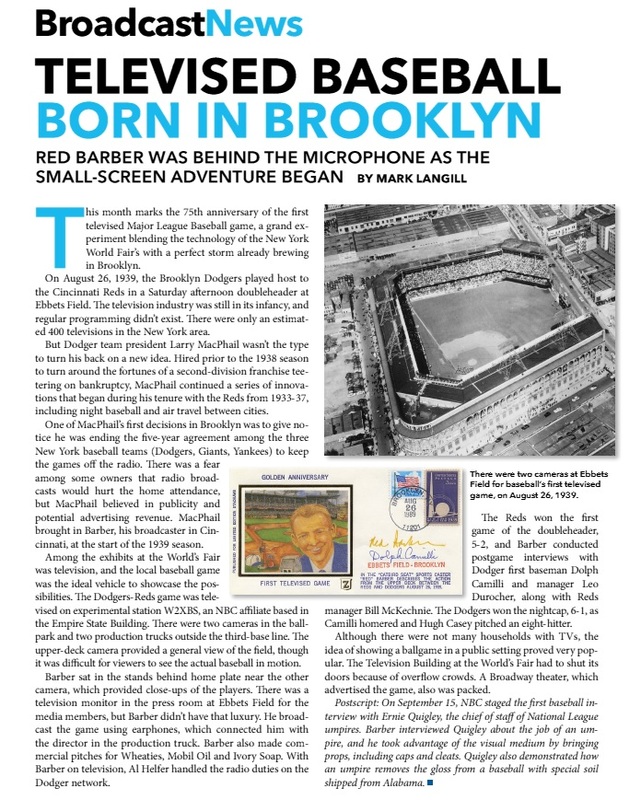 In my own lifetime, the pinnacle of offensive debacles was the first two games of the 1981 National League Division Series, which left me with as hopeless a feeling as I’ve ever had: 20 innings, one run, two walkoff losses. That was tough stuff. But the Dodgers came home and outscored Houston, 12-2, in the final three games of the NLDS and were on their way to the next round. The 1988 Dodgers practically hung their legacy on being offensively challenged, a branding that’s only partially deserved (they were slightly below average in offense but seaworthy, before the injuries to Kirk Gibson and others nearly through them overboard). 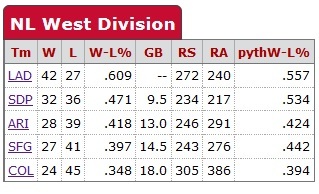 Better offensive teams than the ’88 Dodgers have come up short, but there’s no way to know in advance. Repeat: there’s no way. In the end, the team is either going to score when it counts or it won’t. The Dodgers’ rumored interest in slugger Adam Dunn naturally would make one wonder where he would fit on a theoretical postseason roster. Though Dunn appears to be headed to Oakland, with tonight’s 9 p.m. deadline to acquire players for postseason play, let’s take a completely unofficial look at how the Dodgers’ playoff 25 would stack up if no moves are made today. At the time, the Dodgers were far ahead of team-record strikeout paces both on offense and on the mound. Now that we’ve only got a month to go, and with the team striking out 15 times in their 3-2, 12-inning loss Friday, I thought I’d see where things stood. However, it’s interesting that the strikeout record on offense is nearly 20 years old. The ’96 Dodgers had six players with at least 90 strikeouts, including 121 from Eric Karros, 122 from Raul Mondesi and 124 from … Delino DeShields. The radical, four-on-the-floor finish to one of the crazier 3-2 games you’ll see might not soon be forgotten. Then again it might, if these kinds of extreme defensive shifts become more commonplace. How close it came to working to perfection. 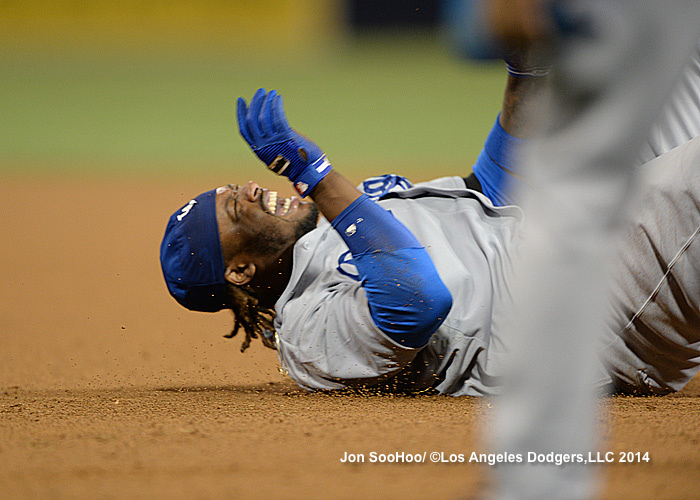 Even with Dee Gordon’s throw bouncing home, the Dodgers missed the inning-ending double play by a hair. Because Andre Ethier was still officially a center fielder at this point even though he was stationed at first (with Adrian Gonzalez to his right), we just missed seeing a 4-2-8 double play. Gordon had some rough times in Friday’s loss to the Padres, going 0 for 6 with a throwing error, though he hit a monster fly ball with one on in the fifth that deserved to be a go-ahead home run (inside or outside the park), only for Rymer Liriano to flag it at the top of the fence. Actually, the lingering sensation from Friday’s game might center on Hanley Ramirez, who came within a triple of the cycle even though he injured himself again, this time slipping on a wet base – and then getting called out via replay on his attempt to make it back to first. Ramirez, who hit an even more monstrous fly ball in the eighth to actually tie the game, looked Pedro Guerreroesque circling the bases (fans of a certain age will recall Guerrero hurting his back on a home run swing and barely making it around the diamond). The Dodgers have had a welcome week’s worth of good news on the injury front, but that’s now in jeopardy. Matt Kemp, who had eight home runs for the season one month ago, has moved in position to lead the Dodgers in circuit clouts. Kemp has doubled his 2014 homer total since July 29, moving past Scott Van Slyke, Yasiel Puig and Hanley Ramirez to within two of Adrian Gonzalez. He has a .584 slugging percentage and .923 OPS in that time. What’s weird about the potential of Kemp leading the Dodgers in home runs is that he won’t lead them in innings played at any position. He is all but guaranteed to finish behind Carl Crawford in left field, Yasiel Puig in right field and either Puig or Andre Ethier in center. While Kemp has certainly been a regular in the outfield, his season will be split fairly neatly among the three positions. So far, Kemp has played 369 1/3 innings in left, 326 in center and 287 1/3 in right. The last Dodger to lead the team in home runs without a regular position was Al Ferrara, who hit 16 homers in 1967 while playing fewer innings in right field than Ron Fairly and fewer in left than three other players. Ferrara led the Dodgers in home runs despite only starting 87 games that year. Meanwhile, Van Slyke, who hit his 10th home run and first since July 22 on Wednesday, appears to have escaped serious injury after rolling his ankle. He told Ken Gurnick of MLB.com today that he was fine and ready to play. Single-A Great Lakes pitcher Victor Arano has been sent to the Phillies to complete the August 7 trade for starting pitcher Roberto Hernandez. Arano joins former Loons teammate Jesmuel Valentin as a component of the trade. A 19-year-old righty from Mexico, Arano had a 4.08 ERA in 86 innings for Great Lakes with 83 strikeouts against 108 baserunners. Clayton Kershaw returned to the scene of the biggest crime of his 2014 season and .. walked the first batter he faced on four pitches. In the third inning, with one out, he pitched with the bases loaded for the first time all year. In the fourth, he allowed a double and a single (with an error) to the first two batters he faced, leading to the first unearned run he’s allowed in the regular season since September 13. 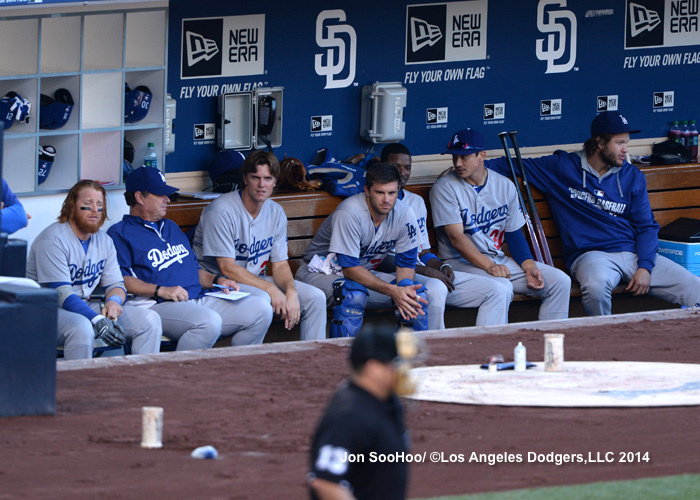 In the fifth, the leadoff hitter hit a triple, the first triple off Kershaw since the May 17 disaster start. But in the end, Kershaw was Kershaw. Retiring 12 of the final 13 hitters he faced and striking out seven of them, Kershaw carried the Dodgers to a 3-1 victory at Arizona. His 2014 ERA is now 1.73, its lowest mark since his second start of the season. He struck out 10 batters, giving him three consecutive games with at least 10 strikeouts for the first time since June 20-July 2, 2011. His record since May 17: 139 innings, 85 hits, 20 walks, 166 strikeouts, 1.29 ERA. In his past 750 innings, the 26-year-old left-hander has a 1.99 ERA. Kenley Jansen struck out two in a perfect ninth for his 100th career save. The down note for the Dodgers, who took the lead for good on Matt Kemp’s two-run double in the third inning, was an ankle injury to Scott Van Slyke. Van Slyke, who continued to destroy Arizona starter Wade Miley with a third-inning homer, his fourth (to go with three doubles) in 11 at-bats against the lefty this year, rolled his right ankle while making the aforementioned error, on a ricochet of the ball off Yasiel Puig, and had to leave the game. He is day to day. It’s true. These have been some rocky years for Clayton Kershaw at Arizona’s Chase Field: a five-game, three-year losing streak, the nadir being his five-out, seven-run outing May 17. The losses haven’t all been equal. On September 11, 2012, he allowed an unearned run in seven innings and lost, 1-0. On April 12, 2013, he allowed one earned run in his first seven innings, then left with the bases loaded in the eighth and watched Shawn Tolleson, in his only game of 2013 and his last as a Dodger, walk home two runs in a 3-0 defeat. Overall, Kershaw has had four quality starts out of nine in Arizona, plus a fifth in which he pitched shutout ball for 5 2/3 innings in a 14-1 Dodger victory. He hasn’t had his primo consistency there, but it’s hardly a guaranteed chamber of horrors. Kershaw, of course, has been nearly untouchable since that May 17 debacle: 131 innings, 104 baserunners, 156 strikeouts, 1.37 ERA, .470 opponents’ OPS. One little piece of trivia: Kershaw, who allowed three triples in the second inning May 17, hasn’t allowed a triple since. Hyun-Jin Ryu, eligible to come off the disabled list Friday, threw a bullpen session today, has a simulated game planned for Wednesday and could pitch as soon as Sunday, Ken Gurnick of MLB.com reported on Twitter. Right now, the Dodgers have Clayton Kershaw set up for Wednesday’s starting assignment, followed by an off day Thursday. Then, after Dan Haren and Zack Greinke pitch the first two games of the upcoming series at San Diego, Ryu could slot in. Unlike most SP, Ryu does not throw in the bullpen between starts. Only to assure the staff after injuries. 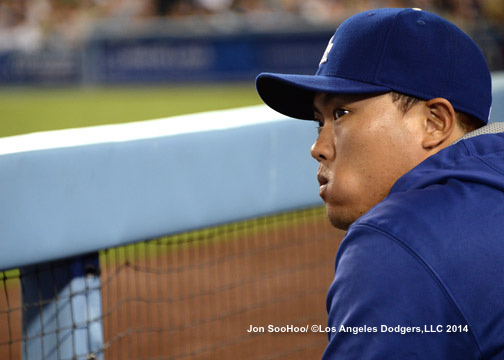 Ryu threw in bullpen but not at max effort. Will have a better idea of when he can return after a more intense bullpen session tomorrow. If Ryu doesn’t start Sunday, then Roberto Hernandez will. Yep, going back 11 weeks, the Dodgers’ opponents on this roadtrip, the Diamondbacks and Padres are tougher opponents than the Giants. With his next stolen base, Dee Gordon will match the total of the 2005 Dodgers (58). That 2005 squad was led in steals by Jayson Werth and Antonio Perez with 11 each, in a year in which Oscar Robles went 0 for 8 and became MLB’s all-time leader in caught stealings without a stolen base. Bryce Harper experimented with Yasiel Puig’s bat. Adam Kilgore of the Washington Post has the backstory. Daniel Brim of Dodgers Digest analyzed Puig’s home run drought. The Dodgers announced that they have signed two more outfielders on the international amateur market: 24-year-old Yadir Drake out of Matanzas, Cuba (signing scouts: Mike Tosar, Patrick Guerrero, Franklin Taveras) and 16-year-old Federico Giordani from Anzio, Italy (signing scouts: Marco Mazzieri, Bob Engle). Great Lakes outfielder Joey Curletta made the Midwest League’s postseason All-Star team. Curletta has a .336 on-base percentage and .385 slugging percentage this season. The honors continued for Joc Pederson, who was named the 2014 Pacific Coast League Rookie of the Year. Corey Seager, Scott Schebler, Darnell Sweeney and Michael Thomas are among the initial selections from the Dodger organization to play in the Arizona Fall League. 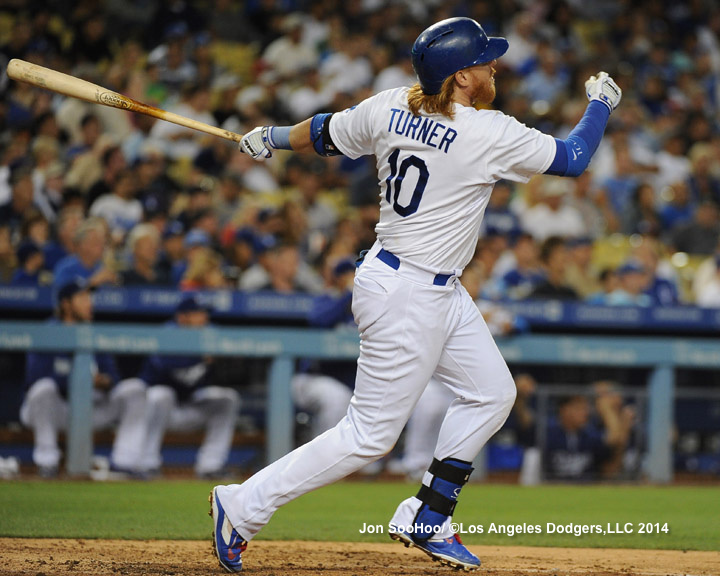 Dustin Nosler of Dodgers Digest and Eric Stephen of True Blue L.A. discuss the choices. David Davis has a closer look at the Juan Marichal-John Roseboro incident at Deadspin. 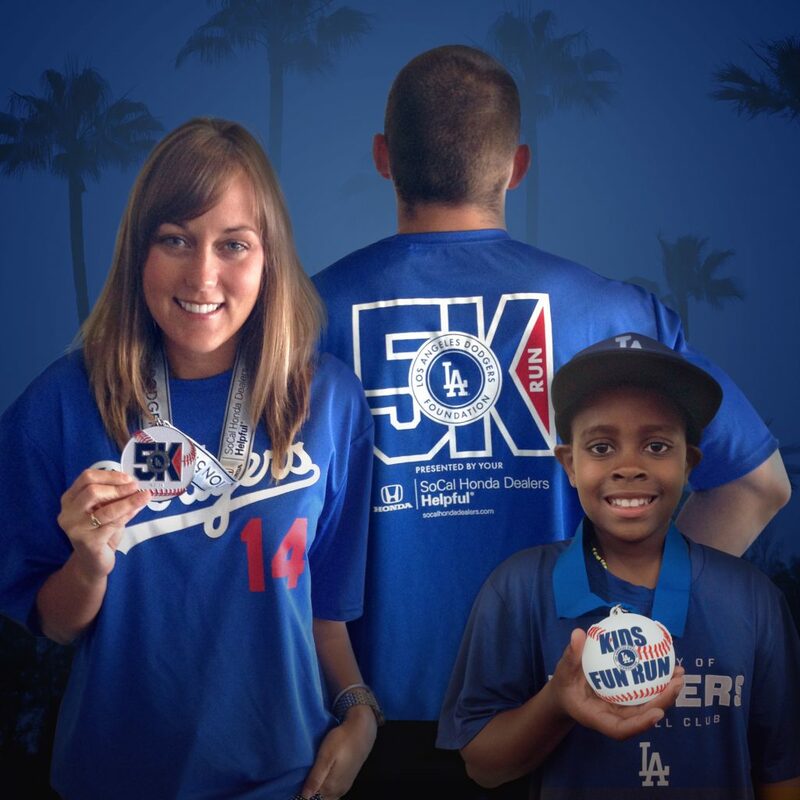 Remember: The first annual Los Angeles Dodgers Foundation 5K Run and Kids Fun Run at Dodger Stadium. is rapidly approaching, on September 21. Signups are moving toward maximum capacity. 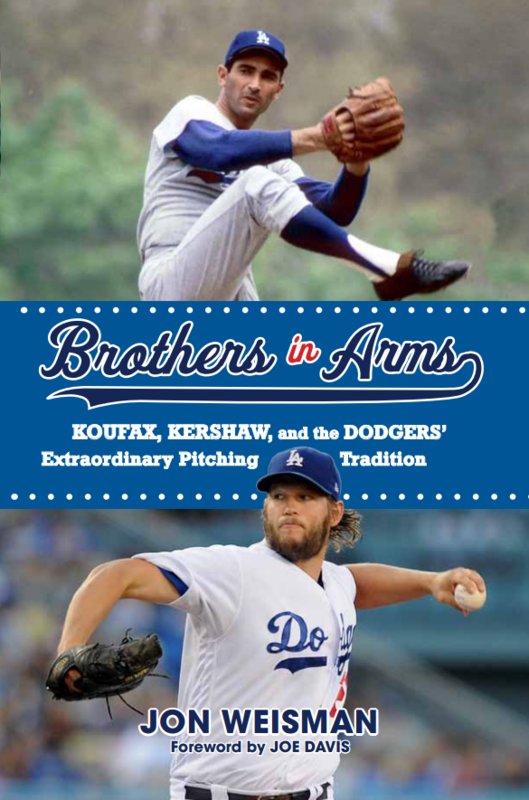 Find out all the details and register at dodgers.com/5K.